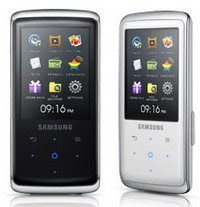 Samsung Q2 MP3 player comes in 8GB and 16GB versions with the estimated price of each $ 99.99 and $ 143.99. Diagonal display for the MP3 player is Samsung Q2 sized 2.4 inch 320x240 pixel resolution with 3.9 inch body dimensions x 1.9 inch x 0.4 inch. While the lack of Samsung Q2 is located on the body design made of plastic so that it looks cheap. Lack of Samsung Q2 is the absence of the automatic volume and touchpad interface that are less ideal.